← Are Pasties the English Dumplings? 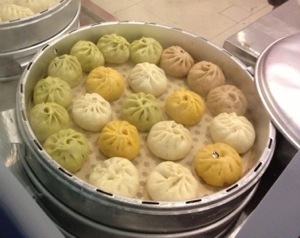 Bunch sells steamed buns so it is not really a dumpling spot, but buns are an allied snack and Bunch serves good ones. Bunch is located at Food Gallery 32, an Asian style food court, on 32nd street in Manhattan’s Korea Town. You can see into Bunch’s open kitchen/steam room from the street and watch the workers pulling fresh buns out of the huge steamers. They only do take out, but there is some seating on the second floor of the food court, which also has plenty of other take out spots with tasty Korean offerings. The Buns. Bunch sells fist sized steamed buns stuffed with a variety of fillings. The bun bread is light and fluffy and they are generously stuffed. I tried the pork bun which was delicious and pretty spicy. Steamed buns as Seen from the street. Bunch also has kimchi, beef, curry and red bean at $2.50 each and shrimp, mushroom and bacon with kimchi at $3:50 each. The Sauce. Bottles of Huy Fong Foods brand sriracha sauce. Location On 32nd street between 5th and 6th avenues in Manhattan in Food Gallery 32, first food stall on your left as you enter the court. 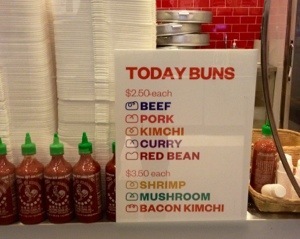 This entry was posted in Buns, New York City, Steamed and tagged Korea Town, Steamed Buns. Bookmark the permalink.